Model: 4R 100 floral / bear. Usage: Insert type side 1 photos (vertical release photos). Fashion, modern design make your life full of sunshine. Included: 1 x Photo Album. Cover material: Paper printing pattern. Holds 120 Photo's. Photo Album (6" x 4"). 120 Photos. Silver Foil "Photos" On Front Of Album. 1 x Photo Album. Your Right to Cancel ?. Faulty products ?. Claims, other than the right to correction of faults with the product covered by these conditions. Material: PVC Plastic Transparent Film. Made of durable plastic material, solid construction and practical. Transparent inside pages with clear photo view. Photo Size: 152x102mm /6.00”x4.02”(appr.). Can insert 84 photos. Album Size: Approx. 11.4cm x 19.2cm x 1.7cm. PP inside pages, 28 pages in total; each page can be put 3 photos. Transparent inner pages make photo see clearly. 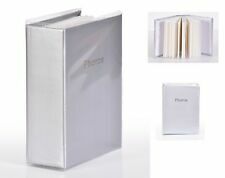 Beautiful Set Of 3 x 200 Slip In Photo Albums 6" x 4" Photos. 2 photos per page. 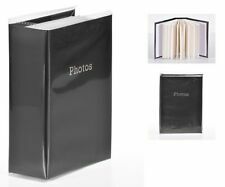 500 Holds 6" x 4" ins photos Special Album - Plain Black Padded Cover. Black with Gold stamp Cover Photo album. Album size: W 33 cm x L 34 cm x H 5 cm (Approx). Hole Puched for standard ring binders. United Kingdom High quality Acid Free archival paper. 12 Unicorn Cupcake Paper Cake Cases Cake Toper Insert Kits Baking Decore Xmas. 20x 2M 20 LED Warm White Micro Rice Wire Copper Fairy String Lights Xmas Party. 3 Tiers Cake Stand Afternoon Tea Wedding Xmas Party Tableware Food Display Stand. Hole Puched for standard ring binders. Rest of World. The mini album Soft jelly texture with Sharp Color ! Pocket Size: Approx 61 x 84mm (holds 64 photos). 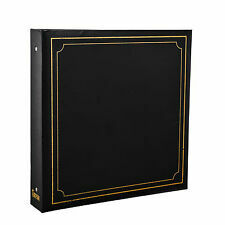 Album Size: Approx 114 x 140 x 28mm. Quantity:1Pc(Only photo album,Not include the card!). Note: Due to the difference between different monito, the picture may not reflect the actual color of the item. Pockets for 200 6'x4' Photos. colors: Black ,Blue or Burgundy. Album size: 22.8 x 18 x 4.8 cm. Insert the photos into the front and back of each sheet. Album size: 22 cm x 22 cm x 4 cm (Approx). Holds 200 photos. Material of Book Cover: Laminated Paper. 500 Double Sided Photo Stickers. Your Right to Cancel ?. Faulty products ?. Claims, other than the right to correction of faults with the product covered by these conditions. The above policies do not affect your statutory rights. Slogan design. Each contains 36 Sheets / 72 Sides ( so totally 72 sheets/ 144 sides). 2 x Self Adhesive Photo Albums. We will always help you to have a 100% positive happy buying experience. 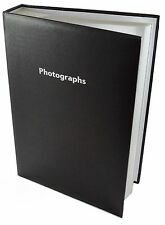 20 Refill Sheet Holds 200 Photos For Large 6x4 Ringbinder Photo Album. Page Refill For Ringbinded Photo Album. Only Refill For Album. Only Refill Well Be Supplied. We Displayed Photo Album For Example. 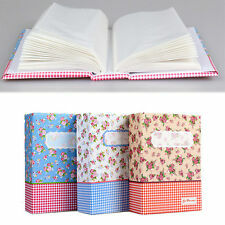 If you bought Self adhesive Ring binder Album Than you can put Extra Sheet. Self Adhesive 20 Sheet/40 Sides Refill For Ringbinder Album. Only Self Adhesive Sheet refill supplied. 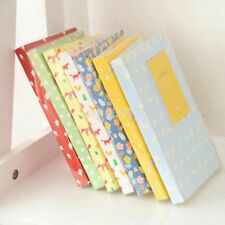 Slip in album contains clear plastic pockets that your photo will fit. It's not only super practical but beautiful Designed Art cover to make perfect gift on all occasions. Front cover with protective PVC Jacket and Ringbinder. Hold 200 Pockets Photos 5" X 7" Photo Album. Price is for single album only. Album Individually shrink wrapped. CD/DVD Pocket at the back of the album. 10X8 cm Window to Insert your own photo. Vintage Photo Album Our Adventure Book Memory DIY Anniversary Scrapbook H.
Can be used as scrapbook, wedding album and guest book. This photo album makes a perfect unique gift for the person in your life who seems to have everything, or you can buy it for yourself. High capacity can hold hundreds of photos. Material: Leather paper. Super Creative impression of a photo album, retro leather tie tie classy appearance and perfect retro Pendant Design. If there's a problem, just let us know and we will fix it. New Photo Album Book Storage Case. Keep your precious stories forever with this album. Film to fit size: 13.5x 9cm. 1 Album Book. The real color of the item may be slightly different from the pictures shown on website caused by many factors such as brightness of your monitor and light brightness. 1 x Glitter Silver Slip In Album. Hard Album Cover. Holds 300 6" x 4" Photos. Album Size 32.5cm x 22cm. Your Right to Cancel ?. Faulty products ?. Claims, other than the right to correction of faults with the product covered by these conditions. This is the Translucent version for storage and NOT the clear print through version. These are designed to fit in a Kenro Negative binder but they will fit a standard file BUT they are wider than standard and will stick out a bit. Album is Spiral Ring Binder That is Sealed. Photo Albums Has 40 Sheets,80 Sides Self Adhesive. Each Page Has a Clear Stick Down Over Seal for Neat Presenting. Album Size : 23 x 5.5 x 28.5 cm Approx. No allocated photo slots so you have the freedom to use as much space as you like. Approx Album Size: 22 x 22cm (9 x 9"). Holds 200 photos. Single Supplied. Album is Spiral Ring Binder That is Sealed. Pink Travel Large Style Spiral Bound Self Adhesive Photo Album 20 Sheets - 40 Sides CL-FL40. 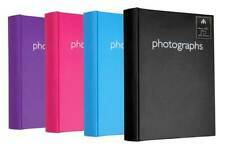 Photo Albums Has 20 Sheets,40 Sides Self Adhesive Sheet. Clear Stick Down Over Seal for Neat Presentation Album With PVC Dust Protection Jacket. Premium quality negative filing sheets for all types of 35mm negative and transparency films. These filing pages are acid-free and archival safe, they can also be written on for recording details of each film. Holds 200 photos. Approx Album Size: 22 x 22cm (9 x 9"). Single Supplied. Want to DIY a photo album as a personalized gift for your best friends?. Desire to record your baby's growth in a chic way?. This item made of premium material is manufactured for durable and practical use. Holds 300 4x6/ 10 x 15 cm PHOTOS - BLACK. Quick and easy to release and apply: Simply pull the release paper and a double sided sticker is supplied. Stick the mount on the object to be fixed and pull off the release paper. Photo Safe &Acid Free. Holds 80 photo's. Photo Album (6" x 4"). Photo album. Black Foil On Front Of Album. Your Right to Cancel ?. Faulty products ?. Claims, other than the right to correction of faults with the product covered by these conditions. Material Pergamin. with filing holes for ring albums! Format 24,5 x 31 cm. Format Ringalbum. Professional Negative Sleeves matt glassine. Seitenanzahl 50 Blatt. Uses a sealed spiral binder to make opening and closing the albums easy and smooth. CLEAR STICK DOWN SELF ADHESIVE SEALS - All pages are white with clear stick-down self adhesive over-seals which can be lifted to place your photos before re-applying, keeping photos firmly and neatly in place. These filing pages are acid-free and archival safe, they can also be written on for recording details of each film. 120 Negative Filing Sheets x 25. Suitable for storing single negatives and/or unmounted slide film. Made from strong Polypropylene (PP) and multi hole punched. Ideal for protecting and storing negatives against outside influences. Number of negatives per page 40. Baby boy hard backed photo album, made by Innova Editions. Baby Boy Photo Album. Baby boy photo album. Holds up to two hundred 6" x 4" photographs. Holds up to 200 photographs. We aim to resolve any problem as quickly as possible. Use for made DIY, baby growth, travel and graduation. 1 Piece Photo Album. - Materials: PU Leather. - Kraft Paper, excellent both for own use and gift. Good quality! Excellent Service! - Retro pendant design, excellent.